The value estimated for MaaS market is expected to be $1,759.82 billion by 2028, growing at a CAGR of 49.55% during 2018-2028. Transportation industry encompasses a wide range of operations within the value network. Private vehicle ownership and public transport system together make up for the majority of the market value. Transportation is a concept which is designed as per the policy implemented by government regulators/authorities in the region. Some of the important criteria which influence the underwriting of regulation for a region can be the socio-economic condition, commuter lifestyle, acceptance of technology, demographic conditions, infrastructure availability, and global economic conditions (such as fossil fuel prices, international trade agreements, environmental challenges, and financial health). The transportation industry is experiencing higher pressure due to the exponential growth in the size (area) and population density of urban cities. The future of transportation industry is digitalization of various operations to enable optimum utilization of resources. Mobility as a Service (MaaS) providers have established a strong foundation for the development of transportation service which can be integrated in multi-direction. MaaS market is a unified part of the global transportation industry. The market trends also suggest that MaaS market will become a leading value generator by the end of 2040. MaaS is the futuristic form of modern transportation service. The global MaaS ecosystem is a complex network of collaborators, strategists, and technologists. A leading factor of this service is on-demand assured ride with associated value-added features. It also gives the consumers a wide range of choices: types of commute, types of pricing, duration of service, choice of driver, and real-time journey optimization, among others. A local taxi service provider is at the grass root level in the mobility service supply chain. Service providers can easily integrate multi-modal options such as sharing of ride, car or bike and leasing of taxi or car for a time-span. A MaaS platform integrates activities such as journey planning, booking car/ride, journey tracking, payment, and service feedback. At its core, mobility as a service combines service solution and manufacturing into an end-to-end service package. It collects various types of service requirements, modes, and planning requirements into an efficiently integrated platform to develop commuter interest in using a convenient service. It can cater to a vast customer base, irrespective of the age, gender, or demography of these customers. MaaS operator collects commuter data in the form of journey, locations, and time spent, among others. This data can be optimized by data analytics to draw important service insights. As one of the most valuable assets in the ecosystem, data enable customer-centric solution development. MaaS can penetrate a commuter’s lifestyle without impacting their daily routines. The digitalization of service industry along with a high penetration of advanced smartphones has led to the acceptance of the mobility as a service market. Further, the development of ICT infrastructure and internet connectivity have resulted in easy accessibility of internet service for more than 65% of the global population. A commuter today prefers to control the services he/she wants, be it partial or complete. The developers of mobility as service supply chain focus on identifying the pain points of a commuter. Mobility service market is highly driven by big data, leveraging the advantage to develop a real-time evolving solution. The future of mobility modes / vehicles is under transformation phase in terms of propulsion technology, autonomous driving (extensive use of driving data, journey, human responses, and robotics), air travel (air-taxi for daily travel), autonomous self-driving mass systems, and high-speed public transport modes, among others. 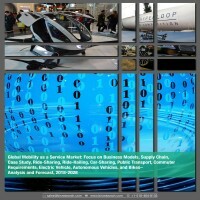 • What is Mobility as a Service (MaaS) market? • What is the market structure for MaaS in key countries? • What are the major factors anticipated to have a positive or a negative impact on the market during 2018-2028? • What are the potential business models for the MaaS operators? • What factors have influenced the penetration of MaaS in key countries such as the U.S., the U.K., and Finland? • Cost comparison for conventional vehicle ownership vs MaaS? • What is the role of autonomous vehicles and electric vehicles in the development of mobility as a service? • What are the key activities and innovation in the global mobility as a service market? • Which are key players in the MaaS market? • What is the global market value forecast for the period 2018-2028? The market is expected to grow about 56 times from 2018 to 2028. The global mobility as a service market is expected to reach $1.76 trillion, estimated to be one-fourth of the total transportation industry by 2028. MaaS market is expected to penetrate over 40% in the urban mobility requirement by 2028. Major drivers for the MaaS market include the growing demand for on-demand transportation service, extensive role of government in the development of MaaS, and integration platform of mobility service ecosystem, among others. In the recent past, many service aggregators have delivered service to commuters in a cost and time effective manner, leading to the acceptance of the industry in many urban parts of the globe. As far as the government role is concerned, an efficient mobility service for transportation is not possible without extensive role of public transport system. Other factors such as industry-friendly policies and the growth of public-private partnerships for service development, among others are key for the development of MaaS ecosystem in any region. Another force that drives the service is the integration of multi-layered service levels into one exclusive service package, which is convenient for a customer. A service assurance, that a vehicle will be available on the go in any emergency or regular situation can attract a consumer towards Maas and discourage them from buying a personal vehicle. Other challenges restraining the growth of this market are customer-centric industry, data security and privacy of consumers, and low awareness about costing for private vehicle ownership and service ownership. The future growth prospects for mobility as a service industry are strong, driven by the growth of electric vehicles and autonomous driving technology. Furthermore, the advancement of information and communication technology has enabled a large segment of services digitalized into an intelligent smartphone app. Consumers have showcased motivating responses toward smartphone-based mobility services during 2013-2018. The report offers insight on “how” Mobility as a Service (MaaS) can transform the future of transportation infrastructure design during 2018-2028. MaaS collaborates all the elements of the transportation ecosystem into one platform to present transportation as a service. The foremost factor for the sky-high rise in the demand of this service is the assurance of on-demand ride availability. It caters to a huge customer base by gaining on the point of providing a convenient commute by assimilating the service requirements, modes, and planning requirements. Additionally, a large amount of data collection, gathered through its service platform enables development of customer target solutions. Further, the advancement of technology has favored in the advancement of this industry. The penetration of smartphones in the lives of people has increased the accessibility of this service. The following figure depicts the estimated value for 2018 and the forecast value for 2028 in a global mobility as a service market scenario. The value estimated for MaaS market is expected to be $1,759.82 billion by 2028, growing at a CAGR of 49.55% during 2018-2028. Mobility as a Service industry requires a well-integrated system of service providers, service integrators, and end users. This integration is categorized into four sub heads- platform providers, transport system, products and services, and customers. MaaS is the futuristic form of modern transportation service. The global MaaS ecosystem is a complex network of collaborators, strategists, and technologists. A leading factor of this service is on-demand assured ride with associated value-added features. It also gives the consumers a wide range of choices: types of commute, types of pricing, duration of service, choice of driver, and real-time journey optimization, among others. A local taxi service provider is at the grass root level in the mobility service supply chain. Service providers can easily integrate multi-modal options such as sharing of ride, car or bike, and leasing of taxi or car for a time-span. A MaaS platform integrates activities such as journey planning, booking car/ride, journey tracking, payment, and service feedback. At its core, mobility as a service combines service solution and manufacturing into an end-to-end service package. It collects various types of service requirements, modes, and planning requirements into an efficiently integrated platform to develop commuter interest in using a convenient service. It can cater to a vast customer base, irrespective of the age, gender, or demography of these customers. MaaS operator collects commuter data in the form of journey, locations, and time spent, among others. This data can be optimized by data analytics to draw important service insights. As one of the most valuable assets in the ecosystem, data enable customer-centric solution development. MaaS can impact travel behavior of a commuter without directly disrupting the day-to-day activities of the commuters. It can help a policy maker to drive travel habits into commuters as per the resource availability. MaaS industry is majorly a private sector which focus on disrupting the conventional vehicle ownership model. This has forced the automotive original equipment manufacturer (OEM) to develop their inhouse mobility solution to be competitive in the market. The following figure depicts the factors which would be impacting the mobility as a service product design during 2020-2050. The dominating factors are air-taxis, autonomous vehicles, electric vehicles, use of e-bikes, scooters, and cycles for last and first mile connectivity. In the period around 2020’s, mobility as a service market is expected to grow dependency on gasoline vehicles, and a reduction of gasoline vehicles can be seen post 2023.